A member of the famous yachting family, the Coats of Paisley. He was created a Baronet in 1894, at the same time assuming the additional name of Glen. Sir Thomas has been an ardent supporter of Clyde yachting. He owns the 11-ton cutter Cruiser and the s.y. Hebe. 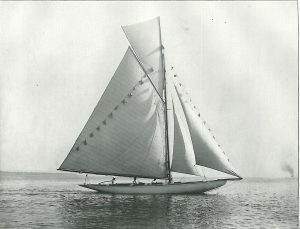 The Cruiser, which he raced with considerable success, was built by Fife in 1886 to G. L. Watson’s designs. She was built as a cruiser, having rather more beam than the 10-tonners of the period and being the same length. 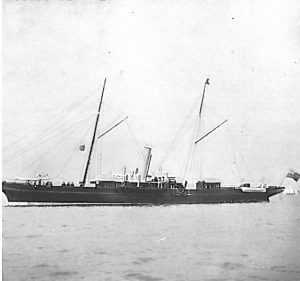 She proved remarkably fast, however, and has taken part in numberless races on the Clyde. Hebe, S. Y., 310 tons. Sir Thomas Glen-Coats, Bart. Clubs: Royal Clyde, Clyde Corinthian, Gourock, Royal Largs, Royal Northern, Oxford University Sailing, Royal ‘Western (Scotland). Residence: Ferguslie Park, Paisley, N.B.